Please Note: You Are Not Pre-Registered without a Lime Green Function 4 Junction Confirmation Card. We will send you your card once your preregistration form and payment are received. Thank you. Includes Cruise on Friday and Show 'n Shine on Saturday as well as Goody Bag with T-shirt, Dash Plaque and other goodies. Includes Cruise on Friday, Show 'n Shine on Saturday and Cruise Saturday Night as well as Goody Bag with T-shirt, Dash Plaque and other goodies. Everything listed above but only cruising on Saturday. NEW! Discount Available for Veterans! 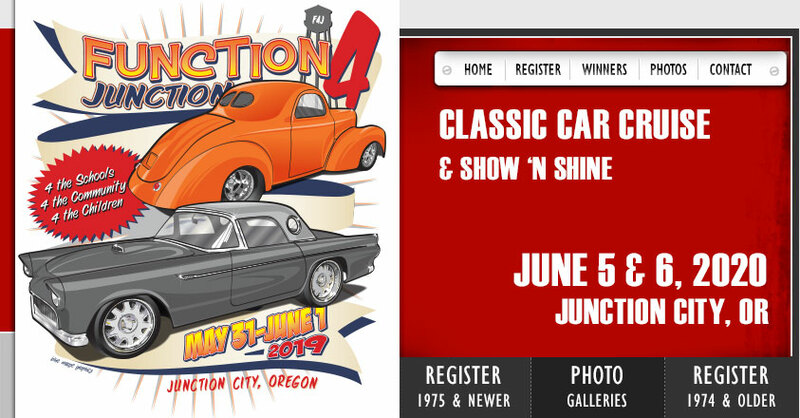 The Function 4 Junction welcomes cars, trucks, motorcycles of all years, makes & models to participate in the show 'n shine. This year the popular not-for-profit event begins with a Friday night cruise from 6:30 p.m. to 9:30 p.m. with a mix of 1975 and newer vehicles and 1974 and earlier classics. On Saturday, a Show-and-Shine in downtown Junction City from 8:00 a.m. to 4:00 p.m. followed by the legendary All-American cruise for 1974 and earlier classics from 6:00 p.m. until 9:00 p.m.
We have two registration options. You may pre-register before May 12, 2019 or register in person on the day of event. Instructions are below. Hours: Registration is Friday, May 31st from 12 p.m. to 7 p.m. in the Junction City Bi-Mart Parking Lot and on Saturday from 8:00 a.m. to 7:00 p.m. in downtown Junction City on Greenwood Street between 4th and 5th Avenues. Pre-registered means that you have paid in advance and have a yellow confirmation card. Pre-registered vehicles will be directed to another line to pick up their goody bags. For your safety and the safety of our registration volunteers, please stay in your vehicle during registration. Fill out form and mail with a check payable to the Function 4 Junction, P. O. Box 65, Junction City, Oregon 97448 before May 12, 2019. You will receive a lime green confirmation card from the Function 4 Junction which is your pre-registration ticket to the show. It must be with you at the time you arrive at registration/check-in on May 31, 2019. 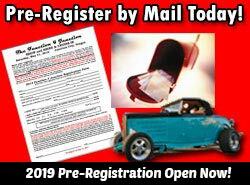 Pre-registration forms must be post marked no later than May 11th, 2019 otherwise participants may register in person the day of the show. After May 11th registration forms must be filled out on the day of the event. Fill out form and bring with you to registration Friday, May 31 at the southwest corner of the Bi-Mart parking lot from noon to 7:00 p.m. or the day following the cruise on Saturday, June 1 from 8 a.m. to 7 p.m. in downtown Junction City on Greenwood Street between 4th and 5th Avenues.